It’s Spring on the blog now *official declaration trumpet sound* so from now on, beauty posts will probably be more Spring related. If we talk about it, it’ll come quicker, right? Right. 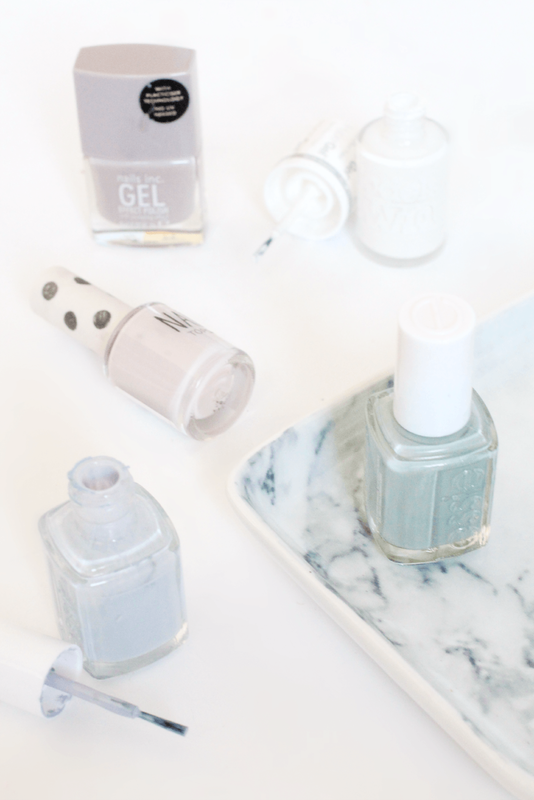 So, today I’m running through all of the alternatives to those sickly pastel nail shades that will no doubt be popping up everywhere until we wish it was Winter again. First is the beautiful green-grey shade that is Essie Maximillian Strasse-Her. Weird name, but it’s a really pretty colour, somewhere in between green, grey and sometimes looks a bit blue. Think I’ll be doing my nails in this next! If you’re not too keen on colour, you could always go for straight up white. For this I’ve picked Models Own HyperGel Polish in White Light, which is a pure snow white shade. It takes two coats to be opaque, but stays on really well and looks gorgeous against a tan. Lilac is such a classic Spring shade, so I’ve went for Essie Lilacism which is my favourite light purple. It’s so, so pretty and isn’t too pale of a shade so it has a bit more to it (if you get me). It always applies perfectly and lasts a long time too, worth a look if you’re after a new lilac! For pink, I opted for an all time favourite of mine which is Topshop Nail Polish in Ethereal. I’ve talked about this before, so won’t say too much, but it’s a beautiful off white-pink tone. It’s definitely a good two coats, but it’s the most pretty shade on the nails. It looks quite refined without looking overly girly, I think! Finally, another classic I talk about a lot on this blog: Nails Inc Gel Polish in Porchester Square. The perfect hybrid between lilac, grey yet it works as a great neutral tone. I’ll won’t say too much about it, but I urge you to buy it if you haven’t already! Don’t forget you can win the rose gold GHD styler and hairdryer in my latest giveaway!